Yes...it's crazy! That's what it was like at the beginning of the week. But crazy in a good way! I would seem that my micro-bakery/breadshare program is catching on, and I'm getting people on board with eating good healthy bread. 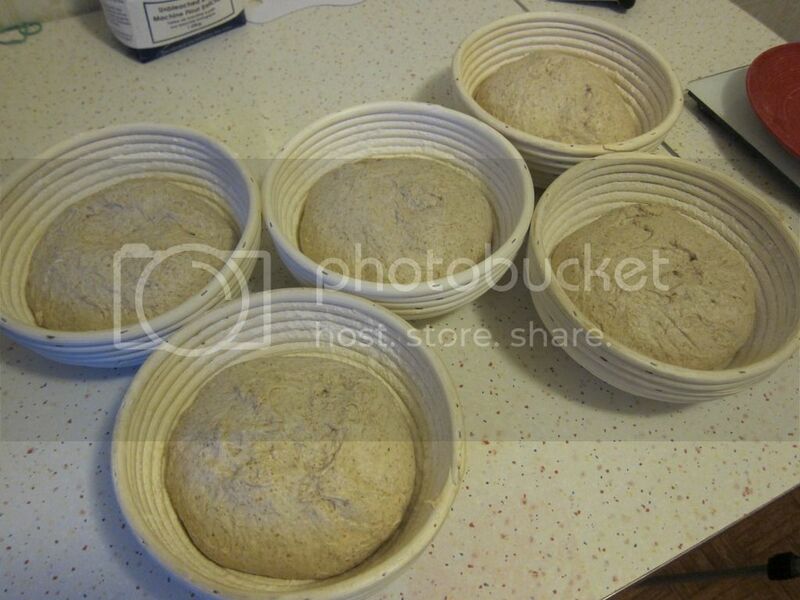 For the first 2 weeks I was baking just 4 loaves per batch, once a week for some neighbors and friends. Word got around and now this week I had an order for 10! It was awesome! So with the purchase of a few new items from Nella Cucina here in Toronto, it made things a lot easier. Had to work out a bit more of the timing process, but all in all it worked pretty good. 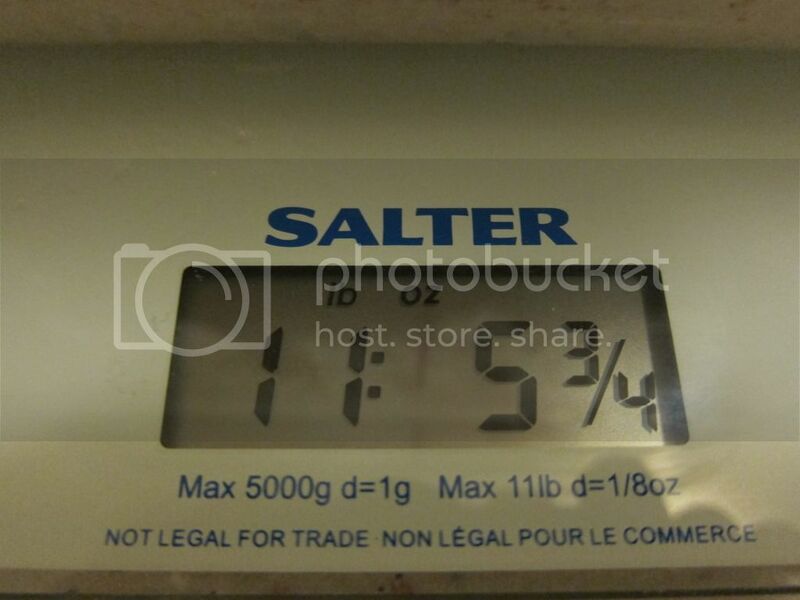 This is my starter bubbles weighing in at around 1600g. 100g used per loaf, with left over for next weeks bake. I usually save around 800g. Pouring bubbles into the mix. All mixing done by hand. Total weight of each finished dough. Stretch and folding these big beauties. 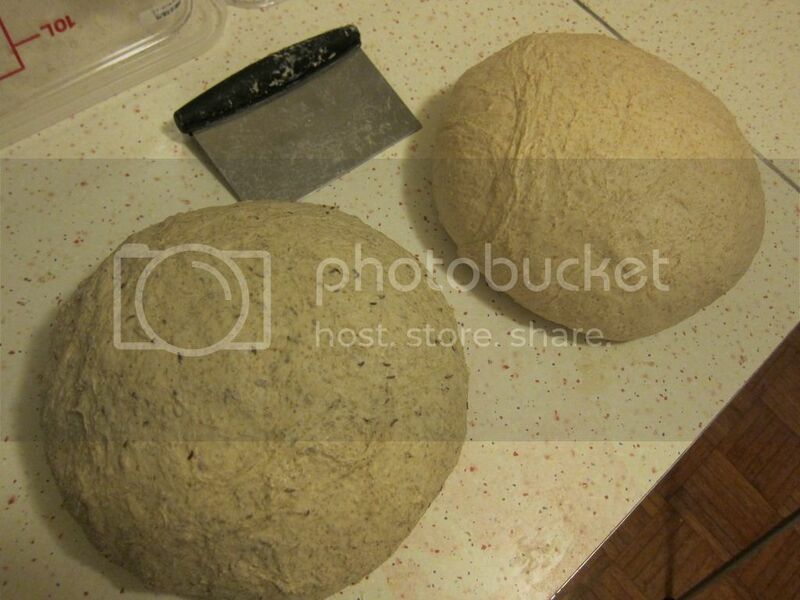 Quite the new thing to be working with this much dough! 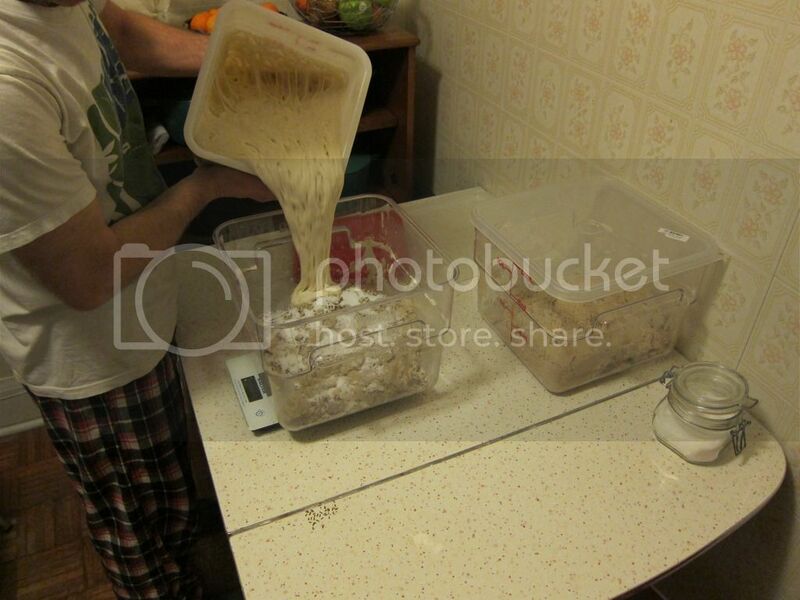 New containers make it a lot easier for mixing and putting in fridge for delayed fermentation. Cutting and weighing. About 800g each. I did a batch of five at a time. Proof the first five, then into the oven. While in the oven proof the second batch. And voila! We have lift off! 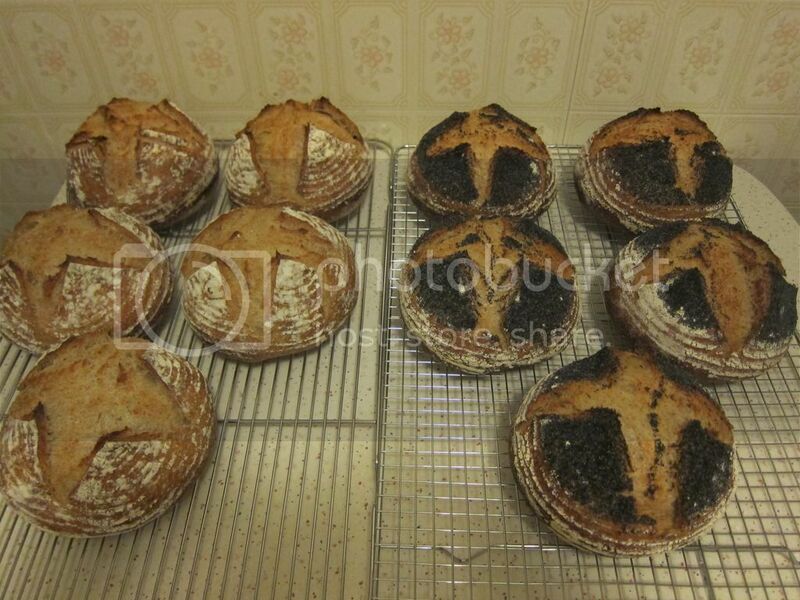 5 loaves of Whole Grain Spelt, and 5 loaves Caraway Rye with Poppy Seeds on top. Thanks to all the inspiring people here on TFL!! You folks and this forum really help to make things like this possible! So many great posts, conversations, feedback, etc! Lovely loaves, the pots are redeeming themselves. Mmmm Caraway? The house aroma must be driving everyone into the kitchen! Thanks Mini! I just corrected the blank space. Which was a lot of blank space. Ya the aroma is driving everyone into the kitchen. So much so that now my neighbors on the first floor want in on it. I should just hook up a venting system into all the surrounding houses. They'll be banging on my door in no time. This is how I got going in my little microbakery and some days I'm now baking over 40 loaves for local shops and markets. Don't let it rule your life though - it's just a hobby (until one day you think -hey, I could really make some money out of this! :-) keep it "low impact" and fun! It's great to hear what your doing as well. 40 loaves is awesome! Congrats on that. I kind of want it to rule my life right now, I'm definitely looking at opening my own bakery someday. But not rushing into it. Just a nice slow build and testing the waters as I go. Your catering thing sounds like it's ready to take off. What's the hesitation?? I love working with large batches of dough. I haven't done 12 lbs of dough, but there is something about doing a stretch and fold with a lot of dough and then dumping out the final product to cut for pre-shaping that is just satisfying. Well done. What is the hydration on those loaves? It's pretty awesome handling 12lbs of dough. I though it would be quite different and more difficult, but that's not the case. 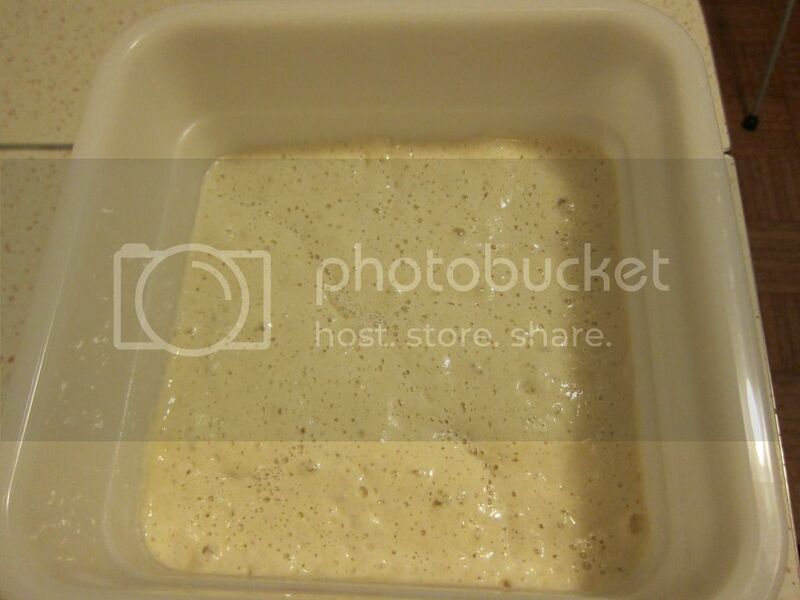 It's fairly easy and the dough still reacts the same as say a 500g dough. I set these at 65% hydration. There's a Ciril Hitz video on youtube where he's doing a bus-tub full of ciabatta dough. It's so hydrated it jiggles when he touches it. But he does stretch-and-folds several times then turns it out onto the bench and cuts and shapes it. I'm sitting there the whole time with my mouth hanging open in awe. I have no aspirations of opening a bakery at this point in my life, just enjoying a profoundly rewarding hobby. But I see stuff like that and think to myself "that is just so cool!" The spelt loaves are set at 30%. Dave, great job. I love the rise on your loaves! Congratulations! The dutch ovens I have are the same size as the loaves, so they really help to keep the shape of the loaf during it's initial rise in the oven. your hobby will grow into business soon enough! A business is what I'm hoping for some day. Nothing too big though! Just a nice little bakery. Beautiful work! 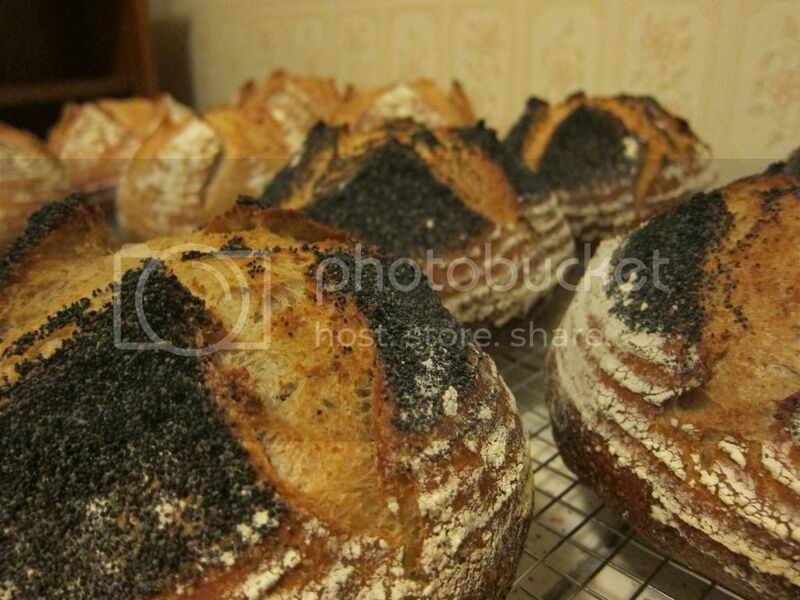 :) we currently do 70 loaves on a Saturday from our micro home bakery, so hectic! 8 varieties and off to market. We started about 12 weeks ago and doubled so far. So I can totally relate, super exciting and a lot of hard work. 70 loaves! AWESOME! Especially out of your home. Some day I will probably hit up our markets here in Toronto. I'm going to visit your page right now. Thanks :) we do have the 2 of us and abig proper oven but its still a lot of work, as you would know! If you haven't already, check some of Mark Sinclairs videos on youtube. For Mark (I guess), and the stuff I do, It's all about scheduling and timing and preparation in-advance. Mark has 3 catering ovens - I have a domestic oven (standard 68 litre) a commercial fan oven (3 shelf, GN 1/1) and a Rofco B40. I think Marks are 600x400mm ovens - my GN1/1 is 530x330. Lots of impressive work on microbakeries - I think we could use a dedicated thread on the topic. Sounds like an awesome little set up! I'm definitely going to follow your facebook page. He is awesome!! I've been following him on and off for awhile now. I love what he is doing. Thanks for some info on your time management. Working backwards in time scheduling is sort of what I also do right now. Kind of makes sense to it that way, especially getting around my regular job hours. Great work Gordon! Sounds a tad busy to say the least :) We have a 2 deck oven which we had steam put into and also added a stone floor to the decks we can fit about 15 loaves per deck. Our doughs are 100% sourdough in 8 varieties with an over night proof. Ya I see that. And your big oven, and your nice big table makes for good work space. Seems you have set yourselves up pretty good at home. Unfortunately I would not be able to do that in the house I'm in right now. Renting the second floor of a house makes that impossible. My next thing would be to rent out a community kitchen, or something like that. That's my dream. I would love to have a micro bakery going from home but using the Dutch ovens, I can only fit one into my oven at a time. When your bakery was in full swing did you use a regular domestic oven or did you have a larger/commercial oven? How many loaves were you baking at a time? I see from FB that you are taking a break. I am in Australia and hope to start something from home in the very near future. ... who you're reply is to here, but Mark Sinclair has a trailer with (from what I recall of his videos) 3 small commercial ovens fitted. I have 2 small commercial ovens (Lincat EC08 and Rofco B40) and a regular domestic electric fan oven. There is at least one person here who I've soon photos of having 4 dutch ovens in his oven at a time... Big oven! And you don't need dutch ovens to make bread - it all depends on the venting of your current oven. 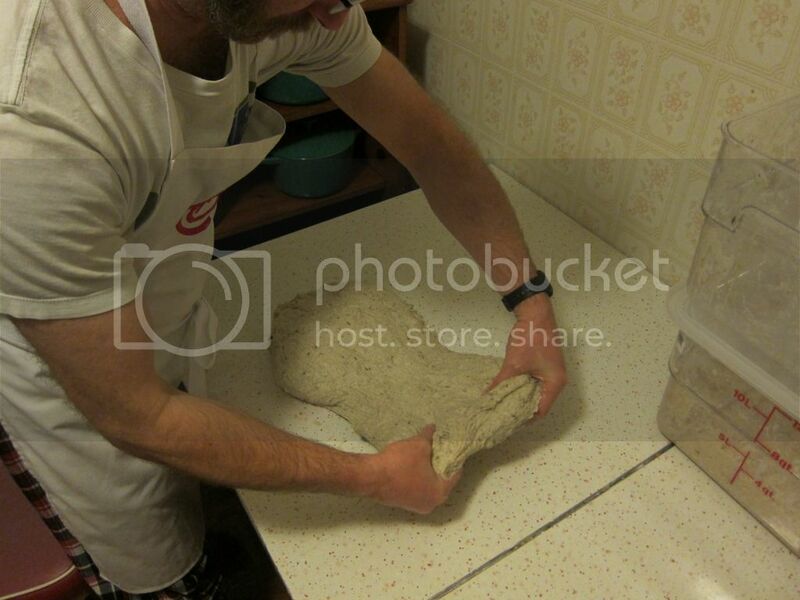 If it doesn't vent, then you can make lovely crusty bread in it, and even if it does (e.g. gas) then there are ways round it. But to do anything remotely commercial you'll need to get an oven that can bake 2 or 4 loaves at once. 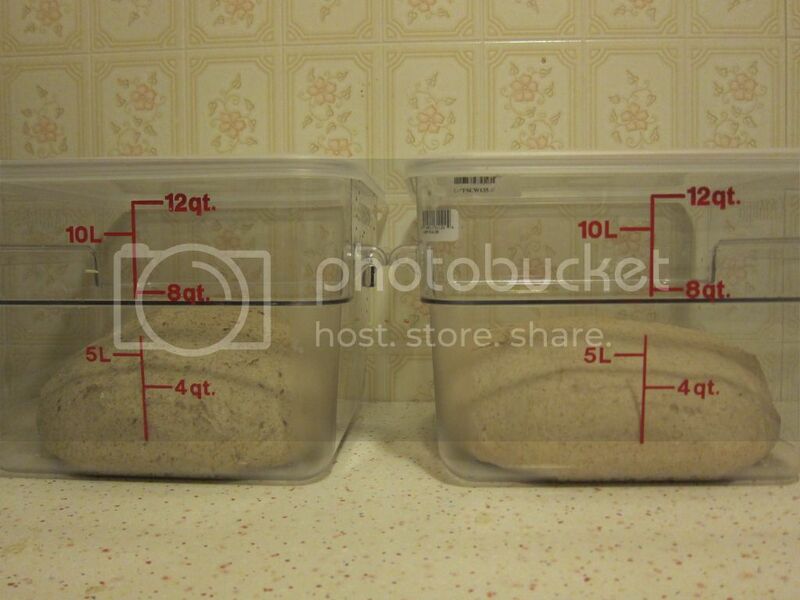 Otherwise you'll take so long making loaves (one every 45 minutes) you'll spend a whole day (or night!) being slave to the oven before you can sell anything! Hey Carolina. My micro bakery has been going awesome! I see you have checked out my FB page. That gives you a pretty good idea about how many loaves I'm doing in one bake. I use a domestic oven. Nothing special about it. It is gas though. And I do use 3qt dutch ovens. 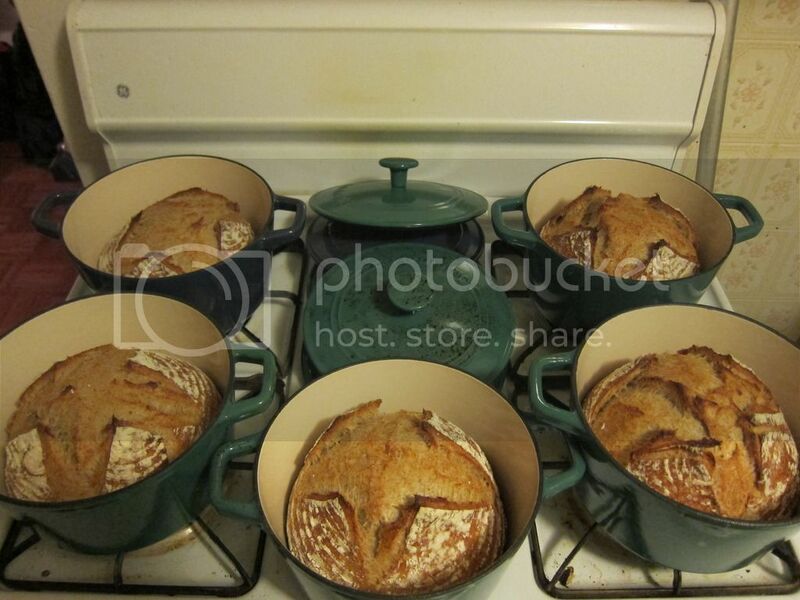 I can fit a total of 8 dutch ovens at once in my oven. 4 on the top rack and 4 on the bottom rack. So yes I am baking 8 loaves at a time. 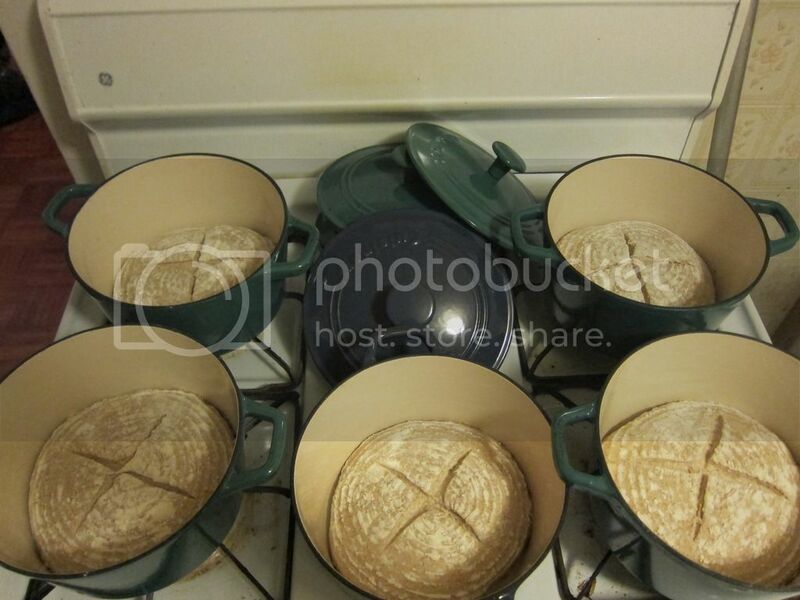 By the time I was in full swing I was baking up to 32 loaves in one night. The baking time took about a total of 5-6 hours. It took a bit of experimenting at first to get down the right size of loaves, how many dutch ovens I could fit in my oven, flour measurements, etc. But once I did the whole thing started to flow pretty smooth. Somehow I don't think you will get the consistency you will need if you don't use dutch ovens. Domestic ovens just don't have even heating, unless you buy a really nice high-end domestic oven. Also I found that dutch ovens rock! In my opinion they really are the best thing to bake bread in, especially boules. I have tried so many times to bake with out a dutch oven and can't get what I'm looking for as compared to baking in a dutch oven. Once they heat up, the temperature in them is pretty consistent. Although I'm sure somebody will tell you different. Go for it Carolina!! Start up your micro bakery!! It's super fun and challenging but eventually when you get your scheduling down, it will flow quite well. You don't need to go out and spend a lot of money or rent out a commercial kitchen. Just look at what you have and make it work. I even set up an account with a culinary store, so I get 20% off my purchases which helped out with my initial set up and still helps out now. I would definitely recommend spending a little extra and getting a really good wooden working table. I bought a nice Boos Block maple top with stainless steel legs and shelf. It makes a world of difference! Anyways I hope this helps out. Feel free to contact me anytime with questions. I can always go through more of my process with you sometime if you like. Wow Dave, lovely to look at. Nothing like finding a store shelf full of Dutch Ovens on sale to get one's juices going. Really nice bake. As I recall, you originally said that your oven can handle 4 at a time, but it looks as though you were able to squeeze another DO in. How long is the oven recovery time between batch bakes, allowing for the DOs to come up to full temp. too? Try 8 at a time Alan! That's right! I managed to find these 3qt DO's that allow me to fit 4 on the top shelf and 4 on the bottom shelf. This time around the DO recovery time was around 30-40 minutes. I suspect I wouldn't need long recovery time anyways. Probably 10 or 15 minutes since it's just re-heating them from 400 degrees to 500 degrees. Thanks for your advice - I am on to it and getting excited.